To meet regulatory requirements, companies are required to install ventilation, suction, water and air purification systems for dusts and pollutants. Bart-technology S.r.l. Designs and builds process plant and process machinery for the fine chemicals industry and now offers its customers integrated solutions that allow the treatment and purification of water and air directly to the machine, or suction systems with fans and filters Centralized and grid networks designed to best integrate into the production plant, ensuring cleaning efficiency and limited maintenance. Dry dust filter groups for dust. With venturi system and countercurrent washing towers with filling bodies. 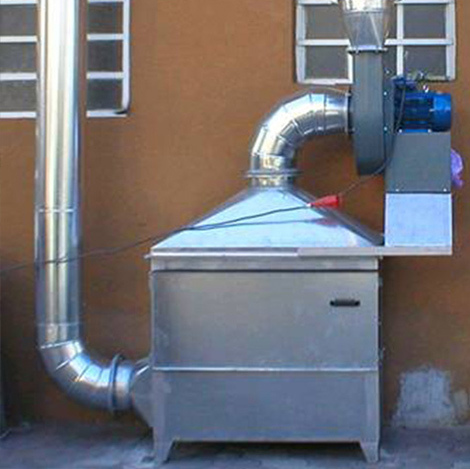 Treatment capacity from 500 to 30,000 mc / h.
To absorb solvent vapors and odors of various nature. Treatment capacity from 500 to 8,000 mc / h.
Laboratory HEPA aspiration-filtering hoods with antistatic plexiglass fairing. Complete with automatic flow control valves and specially designed suction hoods. Of the type articulated with springs and balancing clutches. Centrifugal fans with simple and double aspiration for low, medium and high prevalence. Range from 500 to 80,000 mc / h – Pressures from 50 to 1200 mm H2O.